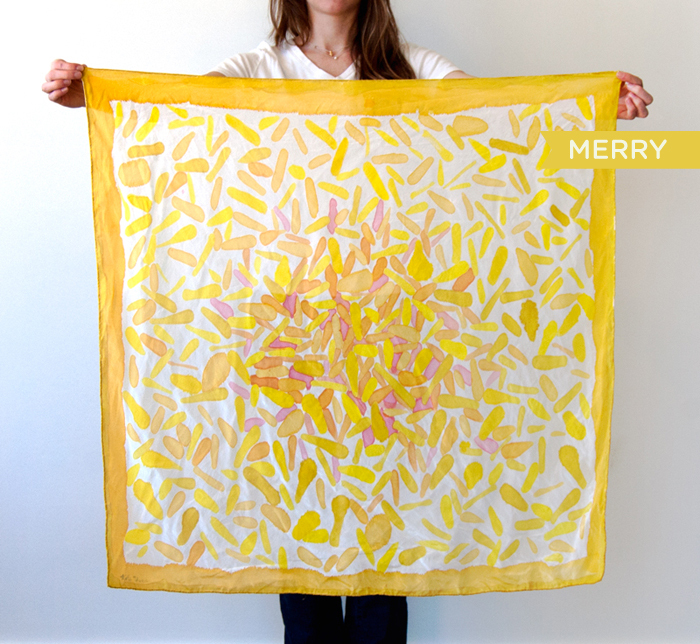 I am thrilled to share with you my first round of hand painted silk scarves. I started researching and reading a month ago on how to do this, but the project has been in the back of my mind for quite a while now. 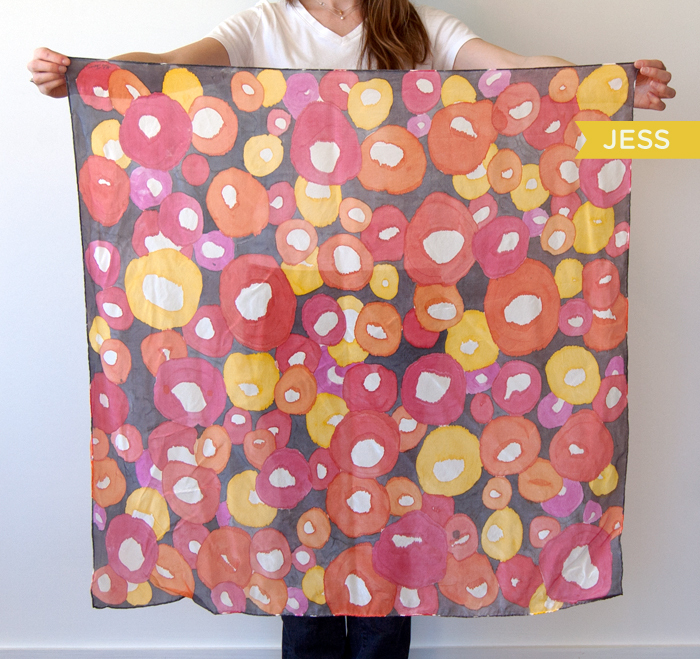 I have over 100 vintage silk scarves that I have been collecting for 10 years now. Most of them I haven’t worn because they are just works of art to me. The designs and colors I always love to stare at. I just have always loved scarves. 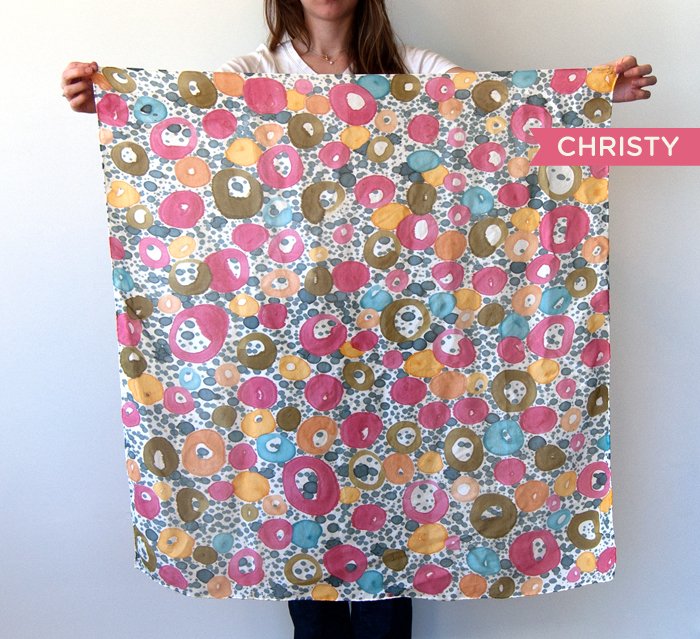 SO I wanted to start making scarves I would want to wear. I’m not gonna talk about how I make these right now. I want to save that for a different post. I want to talk about the value of handmade. I think there is something so special about one person focusing their time on one product at a time, that a machine didn’t just whip out 100 in an hour. 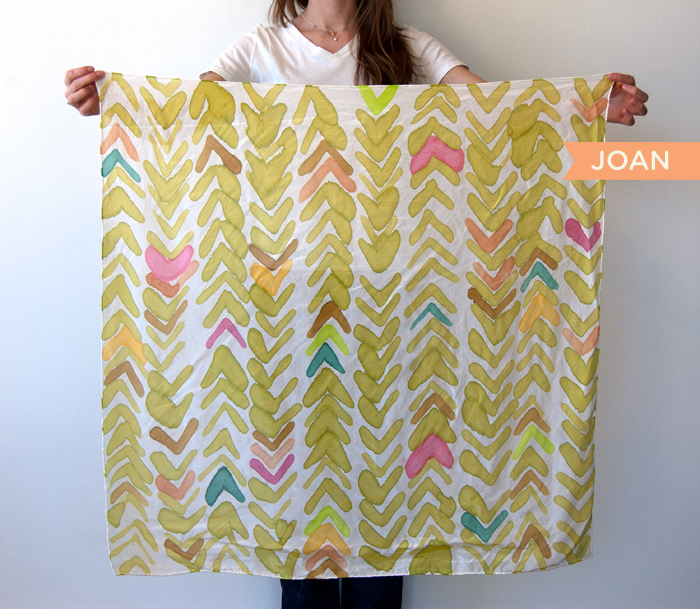 This is why I chose to start off with hand painting every scarf. You’ll see every mark and every mistake of mine on each of these, which makes it beautiful. And that magical thing is that there is not another one like this one. 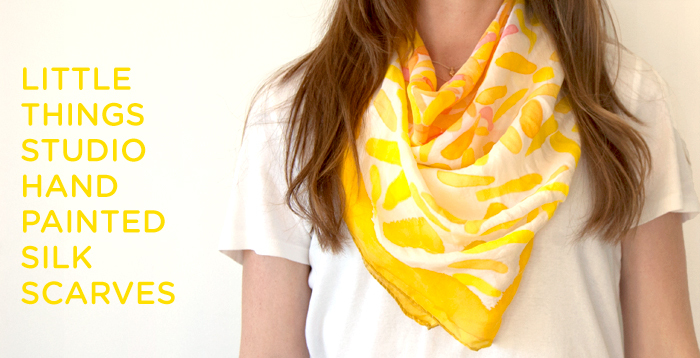 Each of these scarves are unique, one of a kind, special. You know when you walk into a party and a skinnier girl is wearing that same dress… That is NOT going to happen to you with these! If anyone asks, you can say that “a Mississippi girl (who had a quarter-life crisis, rolled over her 401K, went back to school in graphic design, and now runs her own design studio) painted this scarf just for me.” That’s much more interesting than just “made in China.” Although this silk is actually made in China. I couldn’t find any “made in USA” silk! haha! Side note: the paint I’m using is made in the USA. But here’s the thing about handmade. You aren’t just giving money to some big corporation thing (NOT that those are necessarily bad things!) 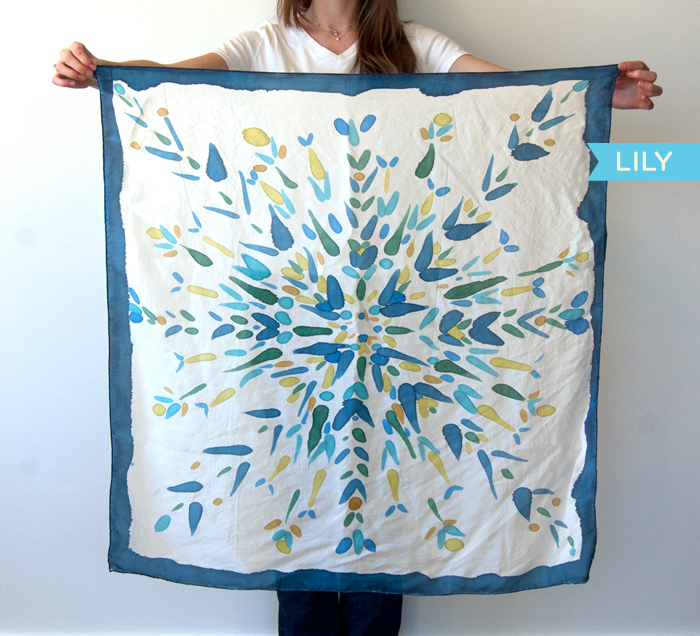 But when you can pick between a department store scarf and a hand painted scarf by someone on etsy, GO with HANDMADE! I wanted to answer a few questions I’ve received about this. I plan on painting different sizes. I’m starting with a small budget for supplies so I can’t buy every size YET. I do have 15″x 60″ size that I plan on starting this week. You can hand wash the scarf in warm water with mild shampoo or silk-wool detergent. Lay flat to dry then iron on the silk setting. OR it can be dry cleaned. If this is left in direct sunlight for days on end, it will fade. I would suggest storing it in a drawer. In a week I made TEN scarves. I have listed 6 today (two have sold, though). When I finish the next four, they’ll be available hopefully Thursday. To see my latest one, you can follow me on Instagram. And if you like one you see, please let me know and I’ll reserve it for you! These scarves are very labor intensive (will explain in separate post later this week). The square scarves start at $80. Hope you enjoy them! Oh! And they are all named after friends, family, and pets in my life. LOVE love love!!! May have to get you to do a custom one with Studio MJW inspired colors and graphics for me to wear while I’m shooting!! wow – these are gorgeous kate! Oh Kate, these are gorgeous! I love them! LOVE! seriously, is there anything you can’t do!? Kate, These are so gorgeous! 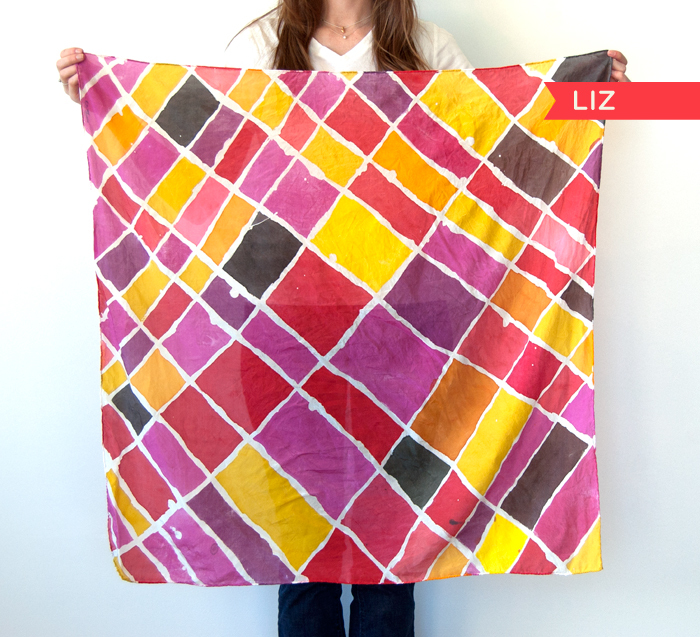 I think the Liz colors are allllll my favorites! Love the way you name things!